Last week I was in Belfast, to do a couple of performances for the project Combination, curated by Sam Hasler and also involving Fiona Goggin and Michelle Horacek. The project was a series of performances over three nights at the Station Project (run by Fiona Goggin, of Platform), an old RUC Police Station in central Belfast. The Station is a strange, uncomfortable, labyrinthine building. It was originally built as a children’s hospital, and its institutional Victorian roots are still very tangible. It bears little visible trace of its 70 odd years as a police station – some “witness report” labels on a shelving unit, a sign demarcating “information room” on an otherwise anonymous door, a blackboard logging “stolen vehicles” and “suspect vehicles” and that’s just about it. And the twelve foot high wire fence in front of the building, but that’s not such an unfamiliar sight here. But weight of the building, its historical role during the troubles (in just the few days that we were there, we heard stories from passersby who had been held and interrogated there, and others who had seen the building bombed and barricaded), and its current position as an empty and transitional space (it’s due to be developed into a hotel) makes it an interesting site for dialogue and action. Having last been in Belfast in 2002 / 2003, the sense of change in the city is quite noticeable – not only in the economic and commercial development of the city centre, but in the openness of conversations had with people and in the general atmopshere of the place, which felt a little more relaxed, a little brighter and a little more distanced from – and reflective about – the trauma that the region is still, nonetheless, dealing with. Many of the wounds are still there, many of the signs of division (the peace walls, the murals, the flags, etc.) are still visible, and many of the structures of sectarianism and organised violence and crime are, if invisibly, undoubtedly there. But there is a sense that the worst is over, that difference can still exist without the violence that accompanied it in the past. As a British (/ English) visitor, I was wary and consious of my position and my responsibility; this was in part postcolonial guilt and paranoia, but also quiet acknowledgement of my own ignorance and remove from the situation. The performance that I did on Thursday was a work that I had previously made in Bristol a couple of months ago. A simple repetitive action involving a bucket full of oranges that were alternately offered to spectators or balanced and squeezed on my head. 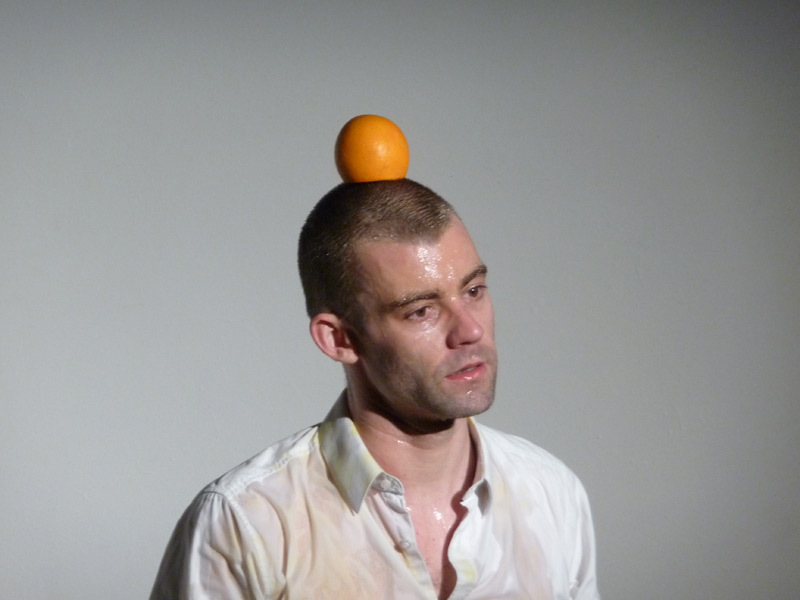 I deliberated for some time beforehand whether I would be able to do the piece without the significance of the oranges changing and overtaking my original intentions – the piece was conceived of as an exploration of artist-audience responsibility, and a zesty and humorous play on action art aesthetics. But repeating the object and word “orange” (“does anyone want an orange?” “orange, anyone?”) and implicating the audience in a mock-torturous action (the acidity of the juice stings my eyes and partially blinds me), has a very different meaning when performed in a boarded-up RUC police station rather than a white wall gallery in England. And that was fine – I realise that the desire to control meaning is one that doesn’t usually concern me, but which in this politically charged city and space had tried to surface and contain. A futile attempt, obviously. And I came to remember that work is the site for meaning to be made, rather than the site for made meaning, and that as such it can be a real catalyst and stimulus for dialogue and exchange. Perhaps this is what it is good for, for an opening up and as an offering into the world, however that world may receive it. My second performance on Saturday was a much more open, abstracted and durational piece in which I attempted to divine and to exorcise some of the demons of the building, using gold glitter, a broken umbrella and a bunch of pink gladioli. It was also very successful, in bringing a degree of lightness and humour to the space, but also (less expectedly, but more interestingly) materialising the struggle and dialogue that exists between the artist / artwork and its context, between me and the building (as the hospital, as the RUC station, as a place of internment and a symbol of the troubles). In this struggle, unsurprisingly, there was no clear winner, but then it seems there rarely is – sometimes simply balance is enough.